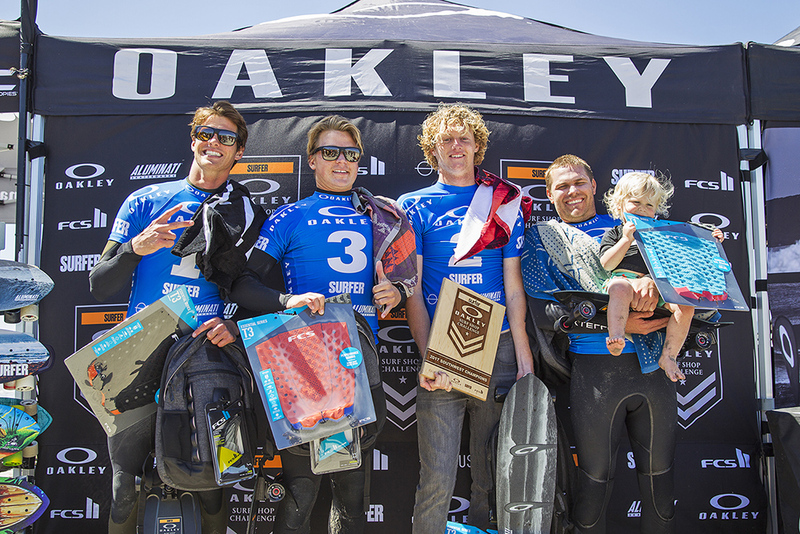 SAN CLEMENTE, Calif., March 28, 2017 – San Diego County's best surf shops converged at Seaside Reef last weekend to compete in the first stop of the Oakley Surf Shop Challenge. The event kicked off in pumping surf with 12 teams set to battle it out for the title of the 2017 Southwest Champions and a year's worth of bragging rights. Sun Diego Boardshop's Mission Beach team narrowly edged out defending champions Surf Ride of Oceanside, 33.78 to 31.87, to take the title. In a highly contested final, Jordy Collins of Surf Ride Oceanside whammied a solid 9.28 (out of 10), but it wasn't quite enough to top Taylor Clark’s whammied 9.67 ride which secured Sun Diego's first victory in the event's history. The Sun Diego team will meet the rest of the regional qualifiers this fall when all seven teams convene at the National Championships to battle for the title of the Most Core Surf Shop in America. The Oakley Surf Shop Challenge series heads to Paradise Beach Park in Melbourne, Florida for stop number two, the Southeast regional on April 6, 7 or 8, depending on conditions.